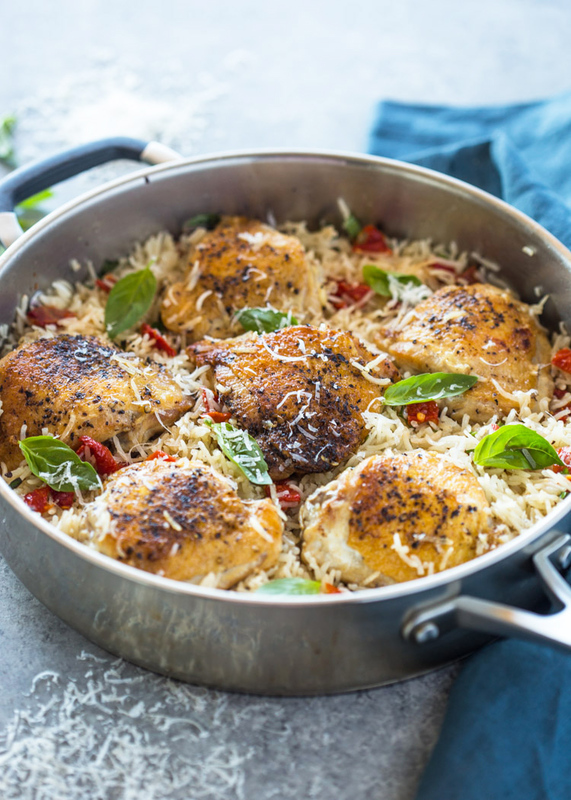 Crispy on the outside and tender on the inside, chicken thighs and rice infused with sun-dried tomatoes, basil, and parmesan. This tasty Mediterranean style dish is loaded with flavors and textures and cooked all in one pan for easy clean-up! Flavor flavor flavor! If you’re looking for a quick and easy dish that is packed full of flavor and texture, then this is the dish for you. It’s all made in one pan so if you hate doing dishes and just love cooking without the clean-up, then you’re in the right place.! 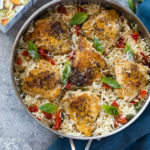 The rice, chicken and everything else is all cooked in one pan which is really what makes the dish so flavorful and delicious. 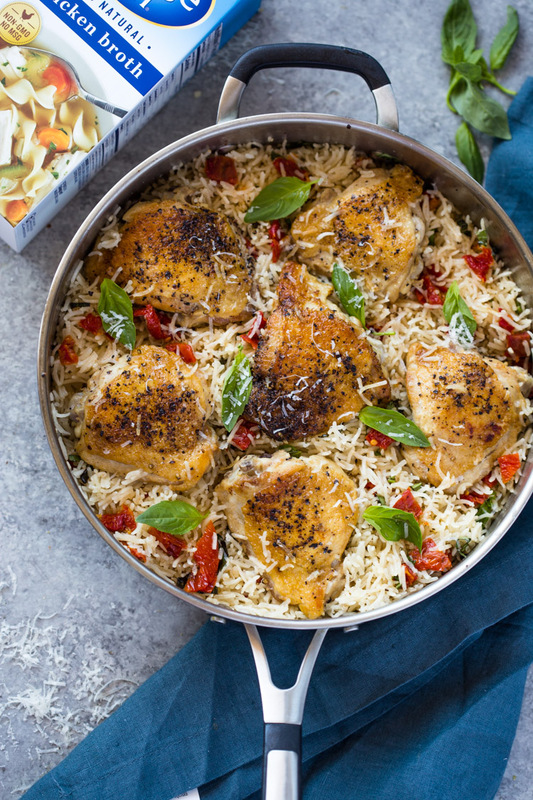 Cooking everything in one pan (or pot) helps all the flavors develop and mix together and allow the rice to absorb all the flavor of the chicken, garlic, and broth. Now, I’m not going to take all the credit for all the delicious flavor because I used a flavor-packed chicken broth that brought this dish to life. I used College Inn’s chicken broth. I love their broths because they are made with only the highest quality ingredients, like all natural chicken or beef, farm-grown vegetables, and the right blend of herbs and spices. I highly suggest using broth to bring out the rich flavors of the chicken and rice. By adding broth instead of water to different grains like rice, or seeds like quinoa you can serve up a dish with a richer and deeper flavor! To start, generously season your chicken thighs with salt and pepper and sear them on a very hot pan for a few minutes until they develop a nice and golden crust. The next step is adding the garlic and chicken stock and cooking the chicken down for at least 10-12 minutes. This step will help soften the chicken before adding the rice. After you’ve cooked the chicken, add your rice and simmer on the lowest possible setting. Keeping the temperature low will cook the rice with the steam and make it fluffy. Now the last step is adding chopped sun-dried tomatoes, parmesan, and basil. The addition of these flavor-packed Mediterranean ingredients will truly make you feel like you’re eating a restaurant style dish in the Greek Islands! Heat olive oil in a large heavy-duty pan or pot. Season the chicken thighs with salt and pepper and place skin-down in the hot pan. Cook 4-5 minutes per side or until golden and browned. Stir in garlic for just 30 seconds. Add 2 cups chicken broth; cover the skillet with the lid. Simmer for 12-15 minutes. 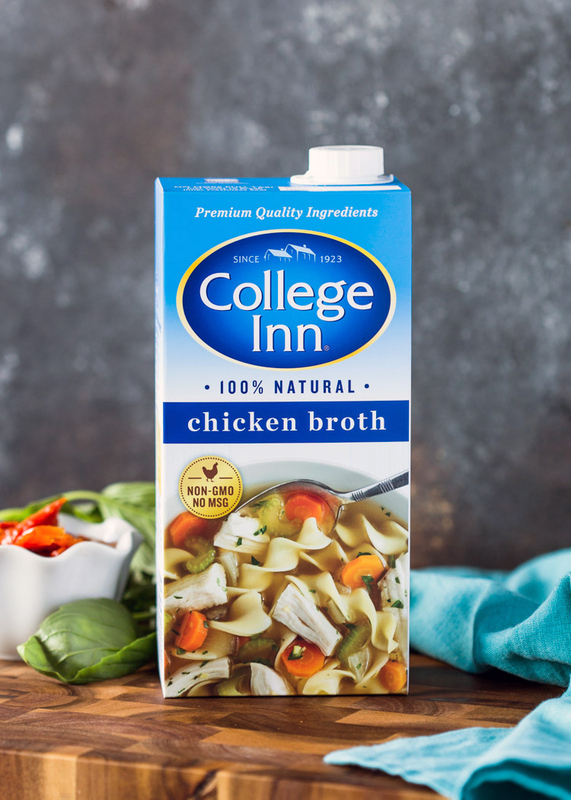 If you happen to try out this recipe, share your experience in social media and be sure to tag #CollegeInnBroth!